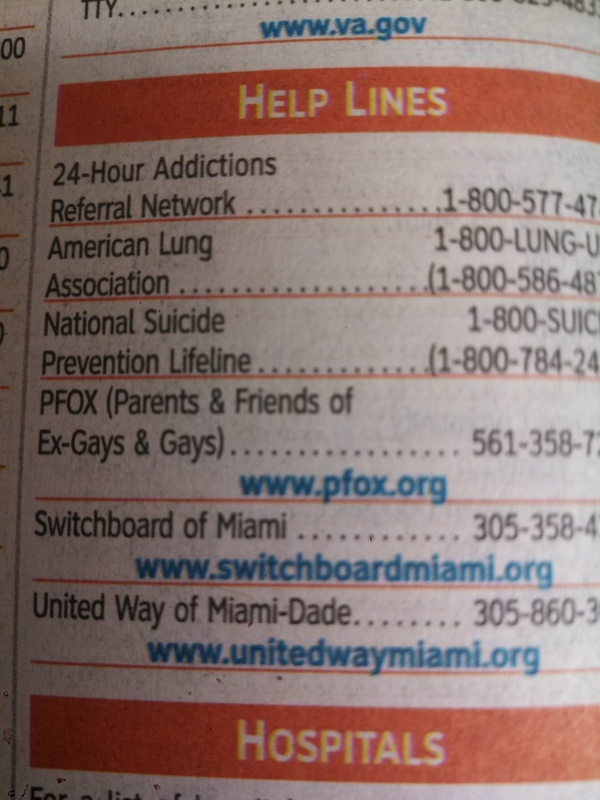 If there is one group in America that should not be listed as a “Help Line” in the telephone book or Yellow Pages, it is the hate group Parents and Friends of Ex-Gays (PFOX). Yet, this pathologically anti-gay organization is slithering into the homes of Americans by listing itself as a legitimate resource. I can’t think of a worse place for a parent or teenager to end up when in crisis, than the clutches of PFOX. The organization is a pile of discredited creep and kooks — like Christopher “Snake Oil” Doyle, who claims he molested girls in his mother’s daycare facility. Or, Richard “Quack” Cohen who was permanently expelled from the American Counseling Association for multiple ethics violations. If you are at home, please check your phone books and let me know if PFOX is listed as a “Help Line.” I can be reached at wbesen@truthwinsout.org. I’d like to get a handle on this problem so we can address it. “Ex-gay” therapy has already been banned for minors in New Jersey and California (and many more states to come). Phone companies across the nation should know that they may be promoting illegal activity in the guise of “help” and should strongly reconsider promoting such dangerous contraband.